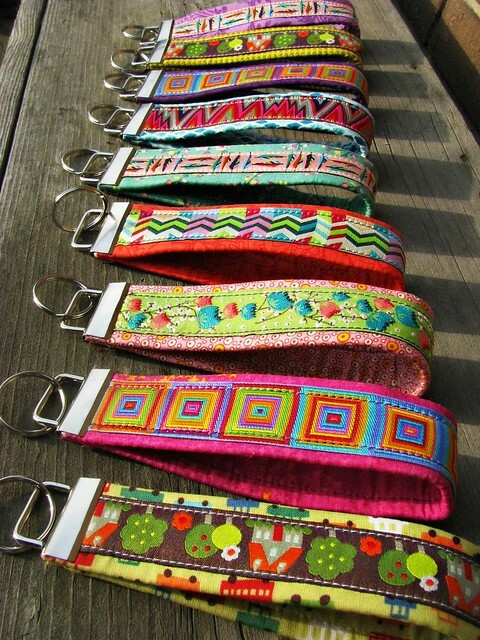 Ribbon key fobs are incredibly easy to make and so handy to carry! If you’re wondering what to make for a fund raiser or just want to send out a little something to some friends, this is a great gift. 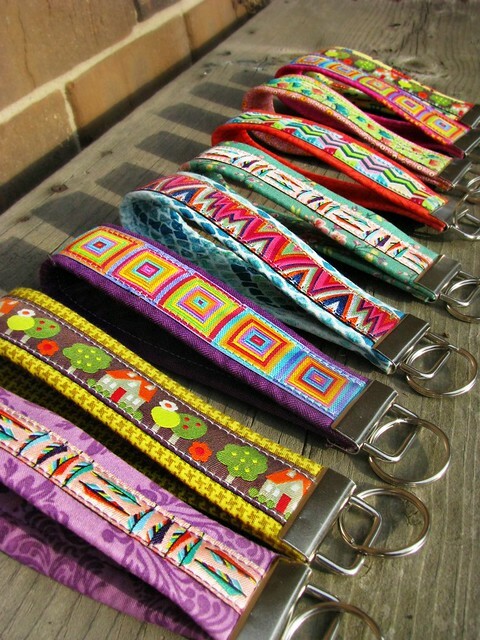 Key fob hardware, like these from Everything Ribbons on Etsy. I used 1.25″ size. Cut the webbing and ribbon to 12″ lengths. Then cut scraps of fabric 12″ x 3.25″ and “wrap” around the webbing. Pressing with a steamy iron will help it stay in place. Then carefully pin the ribbons so that the cut ends of the fabric will be hidden underneath. Sew down either side of the ribbon. If needed, neaten up stray threads from either end of the covered webbing, then insert into the fob hardware and use pliers to press firmly closed. Add your key ring and you’re finished. They’re so comfortable to carry and easy to find from the line of keys hanging up at the gym. These will all be mailed to friends, and I already want to make more! Warning: making these is addictive! Since you only have to sew two lines, you get to try out lots of fun combinations really quickly. And the keychains themselves are wonderful! Where can we order one from you? Hi Jeni! Sorry, I don’t sell the things I make, I use them or give them as gifts. 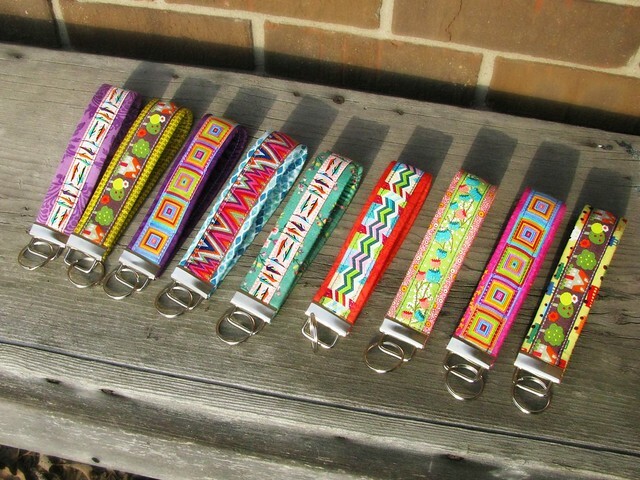 You can follow the links to buy the materials to make them yourself if you like, or visit Etsy.com and search for ribbon key fobs. There are LOTS of people making them, so you’ll find a lot of different styles to choose from.